Digital marketing consultant, storyteller and fitness buff. I enjoy writing about blockchain technology, ICOs, cryptocurrency and everything in-between. Somewhere over the rainbows and beautiful warm beaches of Hawaii, dreams really do come true for international foodies and wine connoisseurs. This is what I learned during a conversation I recently had with my friend and international travel influencer, Scott Eddy. I mentioned to Scott that I wanted to visit Hawaii for my winter vacation this year. As a picky eater, however, I expressed my fear towards the traditional Hawaiian cuisine. After all, I didn't know too much about Hawaiian food except that it consisted of a ton of BBQ, spices and Spam. And let's face it - I wasn't too thrilled about frolicking along the sandy, white beaches of Maui in my bikini after eating fried eggs and Spam for breakfast. After revealing my fear of Spam dishes and unknown spices to Scott, he reassured me that Hawaiian cuisine is actually quite the opposite from what I had described. In fact, he informed me that Hawaii is actually a well-known destination for some of the world's most diverse and delicious meals. In all fairness, I did assume that the Hawaiian seafood and fish dishes would be exceptional, but I never knew that Hawaii offered different culinary options. Coincidently, Scott had just returned from the Fifth Annual Hawaii Food and Wine Festival (the state's largest culinary event), which featured some of Hawaii's most unique dishes, along with a participant list of more than 100 distinguished chefs, sommeliers, wine/spirit producers and famous food personalities. Curious to find out more about the food offerings, Scott informed me that he tasted a variety of show-stopping Hawaiian dishes and spirits during the festival that left him with a lasting impression (which is a big deal coming from someone who has traveled and tasted cuisines from over 50 different countries). Scott's most notable dishes from the Hawaii Food and Wine Festival were prepared by Chef Ryan Luckey of Leilani's on the Beach. He mentioned that he tasted an exceptional Hawaiian Ahi Poke (a traditional Hawaiian food prepared with marinated ahi tuna) that consisted of fresh avocado, kukui nuts, local ogo, shaved Maui onions and crispy taro chips. My mouth began to water just thinking about the texture and taste of this unique Ahi Poke cuisine. In addition to the Ahi Poke, Scott also told me about the delicious local tomatoes in the burrata. This particular burrata was unique because it was prepared with local Maui Cheese Co. mozzarella, Hana fresh tomatoes, pickled onions, radishes, basil oil and a pinch of lava salt. Finally, Scott raved about the gnocchi freshly prepared with Maui onions, a variety of fresh herbs and wine reduction. He also didn't fail to mention that all of these diverse and delectable meals were paired with a glass of vibrant Viognier from California's Simpson Miner Family Vineyard, a super crisp wine with hints of fresh honeysuckle, Meyer lemon and citron peel. If all the food talk wasn't enough, Scott certainly raised my spirits when he mentioned that the 'most innovative stroke of pure genius' during the Hawaii Food and Wine Festival came from the Hali'maile Distilling Company. This local Hawaiian distillery is nestled in the middle of pineapple fields that have been harvested for over a century with the world's best pineapples. 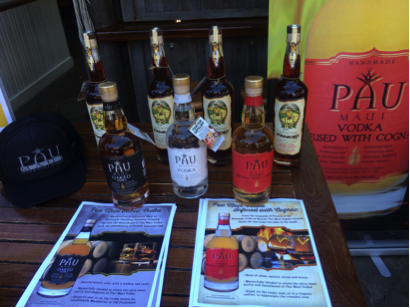 The distillery's Pau Maui Vodka (the original Pau Vodka can be purchased on US mainland) is distilled using the famous Maui Gold Pineapples. You can also find a variety of freshly made spirits such as oaked vodka and coffee whiskey. The extra sweet Maui pineapples also provide a great start for fermentation due to their high sugar content. Who's ready for a drink? Clearly, my perception of Hawaiian cuisine was skewed. While BBQ, Spam and spices commonly make up local Hawaiian dishes, a number of diverse and freshly prepared food offerings can also be found across the beautiful islands of Hawaii. Talking to Scott certainly raised my travel spirits and excitement for my trip. 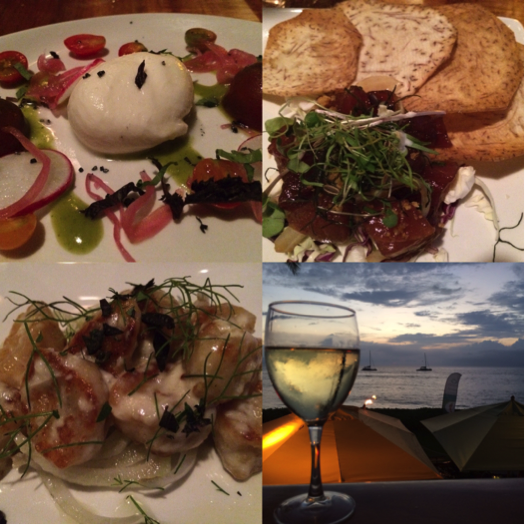 Now, I can't wait to raise a glass of Viognier and cheers to discovering new cuisines and spirits in Hawaii!